Cohesion is thrilled to work regularly with our partners at United Evangelical Church in Canton (3200 Dillon Street). Cohesion's corporate sponsors are also excellent choices for a pre-show meal or a post-show cocktail! Filippo's Restaurant and Lounge is an Italian eatery with a gorgeous new bar area featuring many drink deals throughout the week. It is located at 418 S. Conkling Street, in the heart of the Highlandtown Arts and Entertainment District. Blue Hill Tavern is also a corporate sponsor of Cohesion. Blue Hill is a casual fine dining establishment with many inventive cocktails, and offers happy hour 4-7 pm Monday-Friday. Blue Hill is located at 938 S. Conkling Street, just a couple blocks away from our performance space at United Evangelical Church. 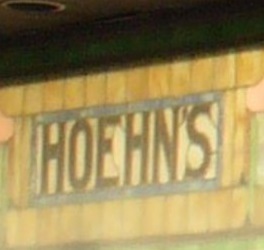 Hoehn's Bakery is a great supporter of Cohesion Theatre Company, and has been since the inaugural season launch party. Hoehn's makes extremely delicious donuts and baked goods in Highlandtown. Hoehn's is located at 400 S. Conkling St, and is open from 7:30 AM-6:00 PM Wednesdays-Fridays, and 7:30 AM-4:00 PM on Saturdays. There are many excellent places to eat before the show on O'Donnell Square. In particular, Shiso Tavern has partnered with Cohesion to develop specialty rolls for our previous production, 13 Dead Husbands! Shiso Tavern is located at 2933 O'Donnell Street. Audiences should be aware that parking in Canton can be difficult. There are many streets around United Evangelical Church that offer convenient free parking, but it can fill up, especially during peak times. Please make sure to allow for additional parking time, if you are driving into the area. There's a decent solution to that most nights. You can park in the Canton Middle School parking lot, which is only about 3 blocks from the theatre. The entrance is on Hudson Street just past the intersection of Hudson and Baylis. There's a handy map picture below for you as well. You'll walk down Hudson to East Avenue and turn left. You'll be at the show about a half block later.